Two weeks ago I was preparing for what could potentially be one of the most exciting days of my life. I am reminded of a song by Bryan Adams where he recalls heady times bashing around in, one presumes, his garage with some mates making music and how those days were the ‘best’. Obviously he led a pretty unfulfilled life from the time of those bashing days up until the point of the release of the song. Could he see in to the future? Surely some great event may still fall his way? Could it not be providing songs for the soundtrack of Kevin Costner’s Robin Hood would give him some good days? This guy has sung with Sting and Rod Stewart so unquestionably they were fabulous days, weren’t they? It’s often a surprise to others when I say that one of the best days of my life was in September 2005, the day I was at the Melbourne Cricket Ground (MCG) to see the Sydney Swans win the Grand Final in the Australian Football League. It’s something the Cliche and I have given each other permission to say. Yes, it was even better than our wedding day. For so many reasons. That isn’t to suggest our wedding day wasn’t fabulous. It certainly was. But we have the rest of our lives together and as the Cliche rightly points out, who wants to think it’s all downhill from there. We’ve had some extraordinary (by that I mean best) days since then, or early mornings in particular as M1 and then M2 arrived to brighten our lives. And the Cliche has been to two successful Grand Finals since then and I know how much they mean to him. 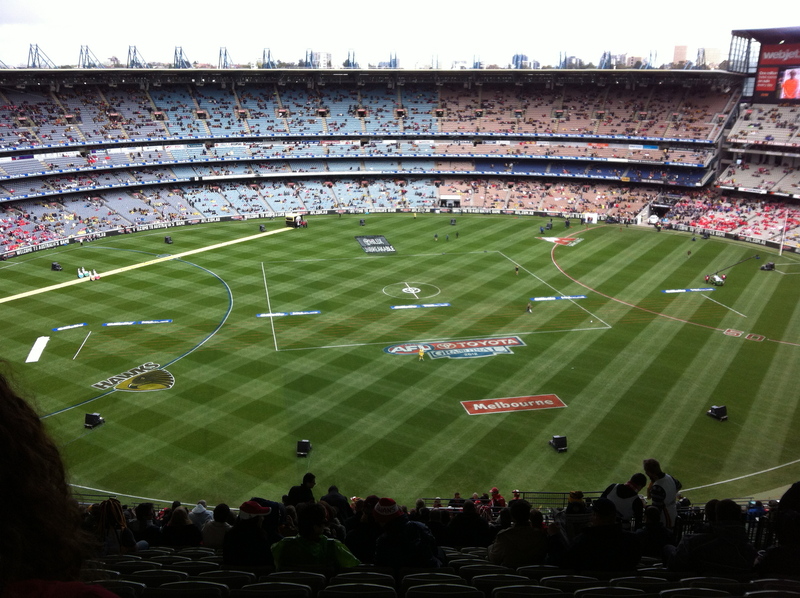 So was the 2012 Sydney Swans Grand Final winning day one of the best of my life? Absolutely. It is a truly rare occasion where one gets to see their football team take the ultimate prize in the competition. You fight to get a ticket to the game. The cost of said ticket is high. You have to find a way of getting to the ground (distance from Sydney to Melbourne = 877.9 kilometres) coupled with the cost of getting to the ground. And then getting home again (in the same day). It’s worth it when you’ve given up your Sunday afternoons of winter sunshine to sit in front of the television to watch every match. It’s all worth it when the siren sounds and you can finally breathe properly. It’s worth it when you can hug the complete stranger sitting next to you at the MCG because they know some of those emotions you’ve been going through. It’s worth it when those 22 players and their coach are standing on the stage, holding the cup aloft while a snowstorm of red and white mini streamers burst forth. I know the Sydney Swans players don’t know me like I know them. I call them by their first names, like we’re mates. And we are. Because one of the great things mates do for you (just ask Bryan) is give you the best days of your life. But unlike Bryan, I expect there are a whole lot more to come. Go Swannies. See you in 2013. 1 We support different teams. Posted in Uncategorized and tagged Marcuse, perfect, Sydney Swans. Bookmark the permalink.